The rate of deaths of Internally Displaced Persons, IDPs in Boko Haram-torn Borno have been shocking with numbers as staggering as 12 to 30 per day! Mostly children. An alerting post by a certain Abba Bukar as published in News Rescue on May 31st brought the dire situation of the IDPs to global attention. It was terrible. IDPs were dying in their dozens daily. Abba lamented that a certain Ya Karu, a 23yrs old woman complained bitterly about how they were starving to death in the Bama IDP camp and how her son had just died of the hunger. The report was followed by several others in various dailies detailing the numbers that were dying of hunger in the 25,000 inhabitant Bama camp as well as others dying in further off camps across the lake Chad region. On June 4th, our NGO, ENDS.ng launched a #NationalFoodDriveForIDPs to help gather food and raise attention to the plight of the displaced persons. On June 11th the Vanguard described the chilling details of deaths at a camp at Banki some 130 kilometres (80 miles) southeast of the Borno state capital. The report stated that 376 graves of IDPs were counted in the Bulachira cemetery from starvation victims that had died in just the last three months. These numbers of deaths trumped those in Boko Haram's heyday. By June 12th we (ENDS) strongly pleaded the Buhari government address the failures of the Borno Shettima administration to adequately fulfill the provision of food, water and health services to rescued displaced persons. Our report contained video evidence of the alleged repackaging and diversion of IDP labelled food bags. While the Shettima government not unexpectedly accused some "opposition" of trying to sabotage their government with the damning video evidence released, the government finally intervened and shipped as many as a thousand severely malnourished IDPs to get medical attention in Maiduguri, the state capital. It was the first publicly noted time such attention was given to the hunger bombed IDPs. There has been long term evidence of a failure of the Borno administration to handle not only the Boko Haram scourge but now the aftermath. There have been several reports of the diversion of series of trailers with supplies for IDPs. At the head of the failure of NEMA and SEMA has been the Kashim Shettima aristocratic administration that by its own admission, helped create and is not able, capable or willing to handle the complexity of the Boko Haram crises. 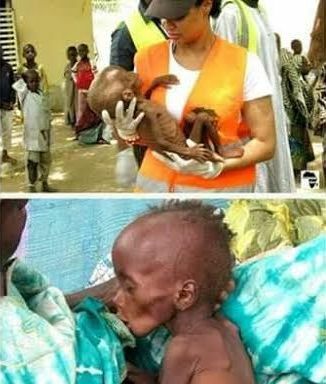 This failure has cruised at emergency levels with Boko Haram terror-bombing deaths and now the starvation hunger bomb delivering dozens of Borno citizens to early graves at one time or the next, before, during and after the war. The Jonathan government has been criticized for failing to declare a full state of emergency in Borno and now it's the turn of the blame to be cast on the Buhari government. A recent report by the global Médecins Sans Frontières (MSF) organization with tearful images of starving children finally prompted the Buhari government to act. NEMA, SEMA and the Borno administration were summoned to Abuja to meet with the Buhari government-head. An emergency team was just sent out to Bama to investigate the current state of suffering in the camps. Serial government oligopolist benefactor Dangote "gave back" by providing some trailers of food to feed some of IDPs for a month. The condition however remains dire. While Bama has come under focus, other camps are too far out and only accessed by military detachments who are not currently under the obligation to transport the needed food to these extremities. There are no adequate medical personnel serving IDP cities like Bama and others. Unlike Western military, the Nigerian army that could/should alert on the state of suffering and deliver needed aid, has no humanitarian record and perhaps rather frequently has the opposite of one. It would be useful the Buhari government sits up and pays attention to the displaced persons as it does to Nigeria's billionaires. IDP health should be an emergency as much as Meniere's ear infection is to the highly placed. Military choppers must get involved in distributing food and other utilities to displaced persons in hard-to-reach camps. Medical personnel should be enticed to volunteer to serve in Bama and other camps. Things as ordinary as water and toilet facilities should be a major focus of attention. The Nigerian government and office of IDP protection (If there is any) should be proactive and not responsive, waiting for media reports before belatedly swinging into damage control posture. The government should anticipate problems for the absolutely vulnerable survivors of Boko Haram. Agencies delivering materials must be independently spied on and fully monitored. There must be citizens reporting from all camps with the civilian-JTF employed and engaged on fact finding missions. Where the government fails to have the resource to protect and feed Boko Haram survivors, the private sector which included Borno youth and global good samaritans, and not just billionaire cabal, should be involved. The Federal government should love these war-torn farmers where the State government fails to. These are our heroes and these are the only people who can restore Borno, the home of peace.